In the upcoming (Nov. 28) True Beadz Russian Lullaby collection there are some fantastic silver beads, that are based on Russian art of the 12th-14th centuries. I didn’t take photos of the Roots bead as it had been sold out when I wrote this (but check Endangered Trolls for info about new availability). 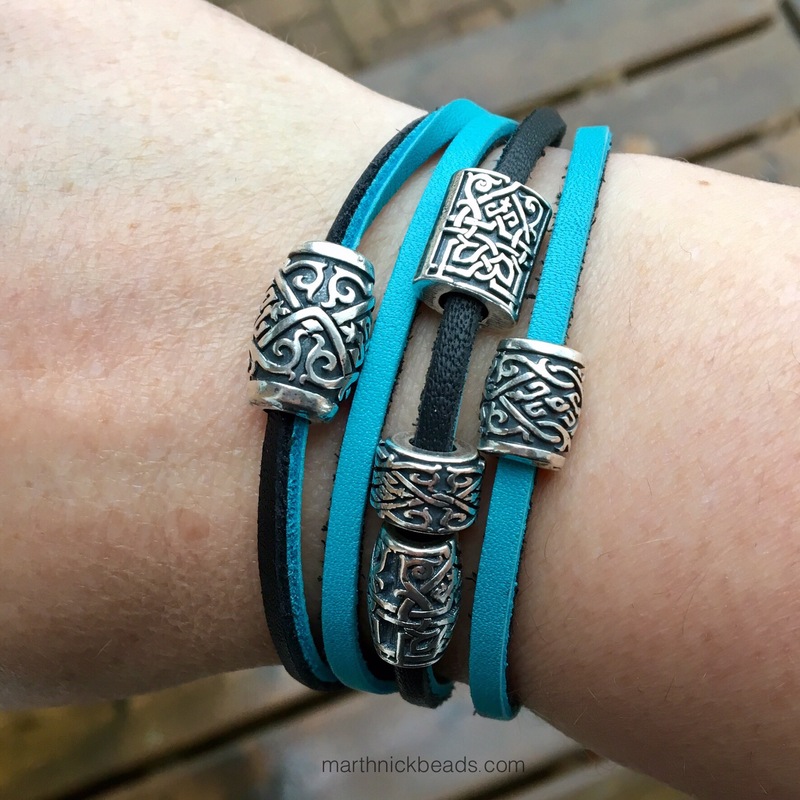 However I did put them all (except the Firebird Dangle) on a Trollbeads leather bracelet for the purpose of showing sizes. On the left is Far Far Away Kingdom Large. On the top is my personal favourite, Once Upon a Time. Under it is The Wheel of Time. Roots is below it and on the right is Far Far Away Kingdom Small. Let’s start with Once Upon a Time. It has an unusual shape as you can see in the photo above. Here’s a close up below. So fabulous! It fits on a newer Pandora leather bracelet, but doesn’t fit on the really old ones. Here I’ve added in two True Beadz Blossom Baby Pink beads and have secured them with Ohm Beads’ Bare Clips. Next is The Wheel of Time. I really love the shape of this one. It’s nice and small yet quite substantial in its weight. Actually, all of the beads are pretty heavy, giving them a really nice feel. Check out the detail on The Wheel of Time below. 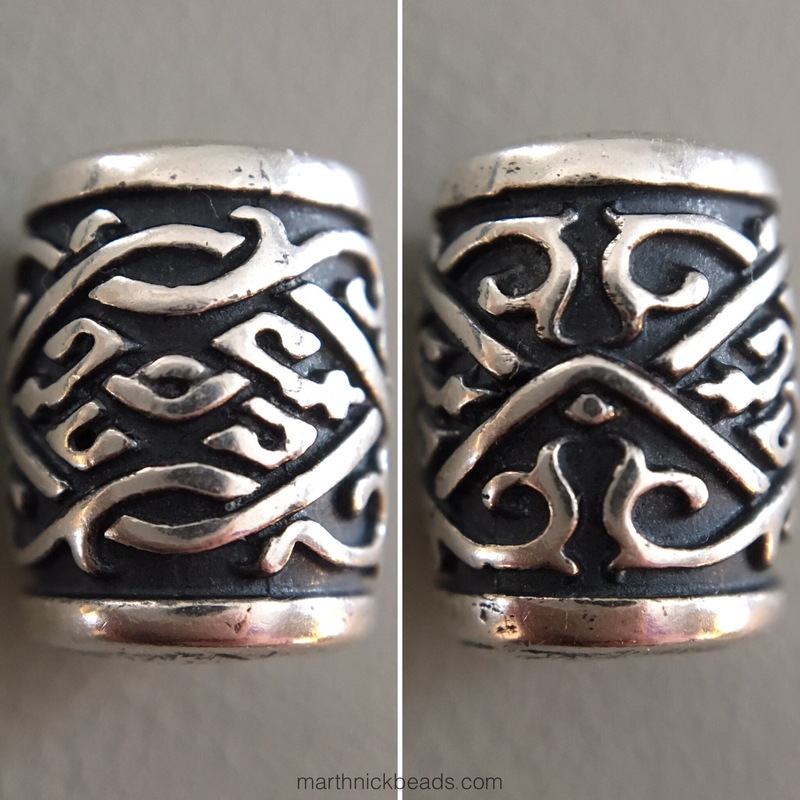 I put it on the Trollbeads Twisted Silver Bangle with a couple of Pandora Geometric Facets and really like this look! 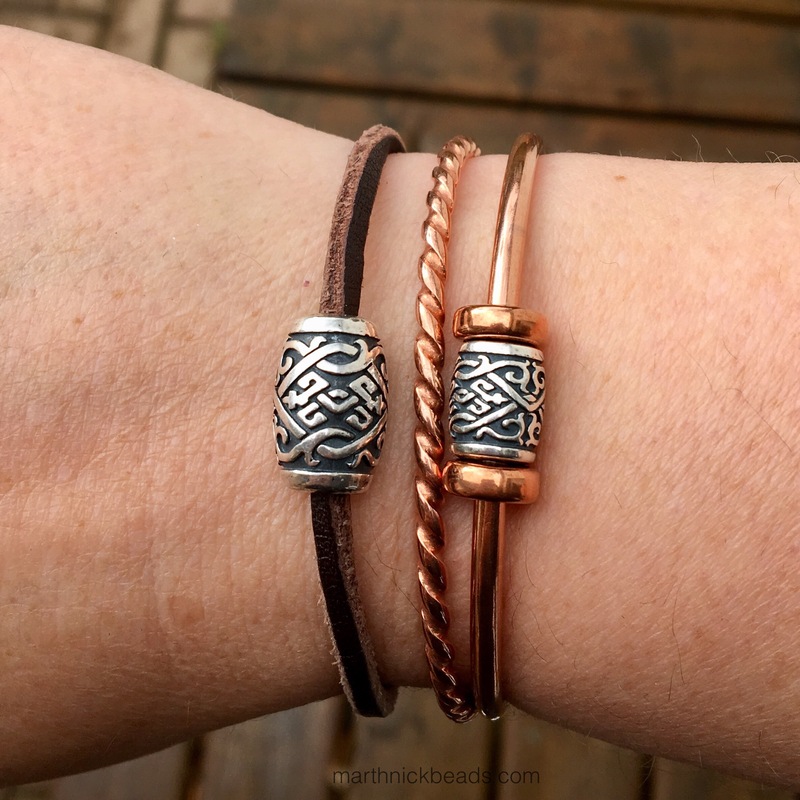 I put them both on a warm looking combo using the Trollbeads copper bangles and brown leather bracelet. This is my favourite combo! 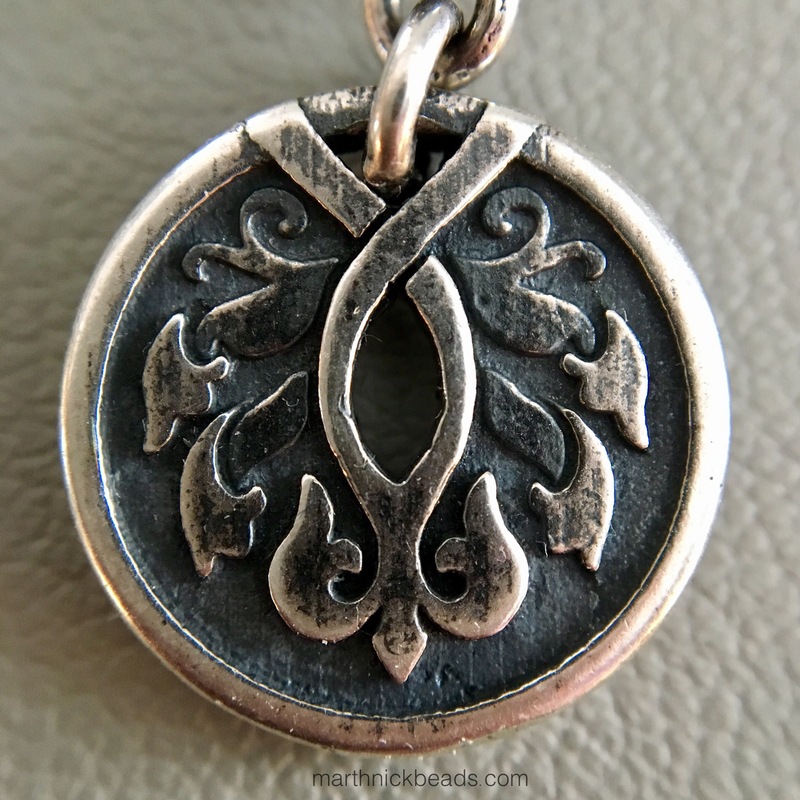 Lastly, here’s the Firebird Dangle. It’s so lovely! Someday I’ll make a Firebird bracelet, based on the Diaghilev/Stravinsky ballet. 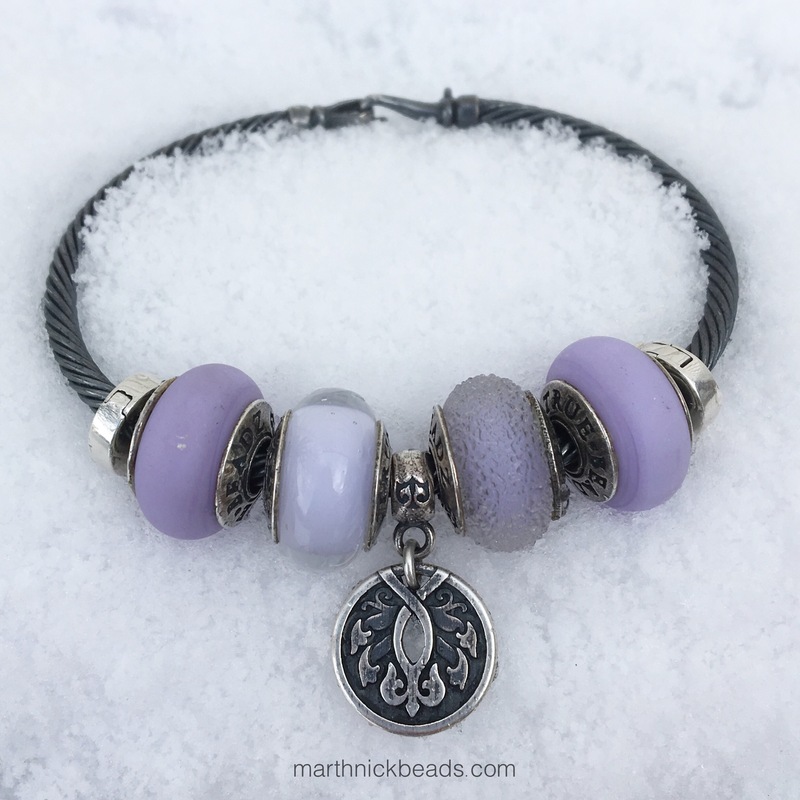 But it snowed and I thought the Lilac shade beads would look pretty with the Ohm Beads Dirty Twisted Bangle against the white. And here’s the dangle up close. Gorgeous! The lines are so graceful. 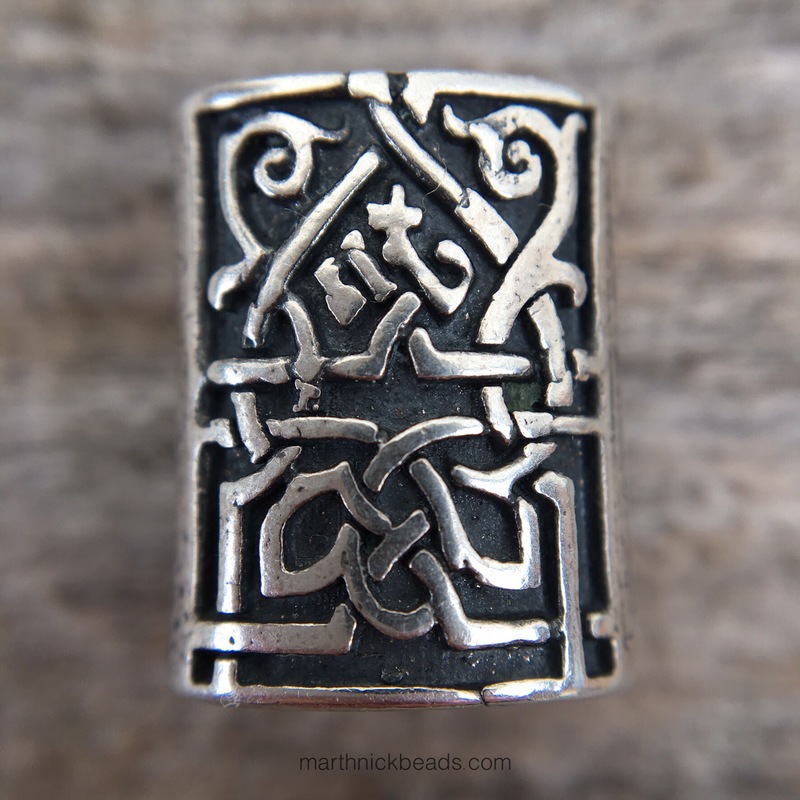 I hope Alexey is making a lot of these silver beads, as I think they will sell well. I don’t know how True Beadz will ever top this collection, as I think it’s just perfect. 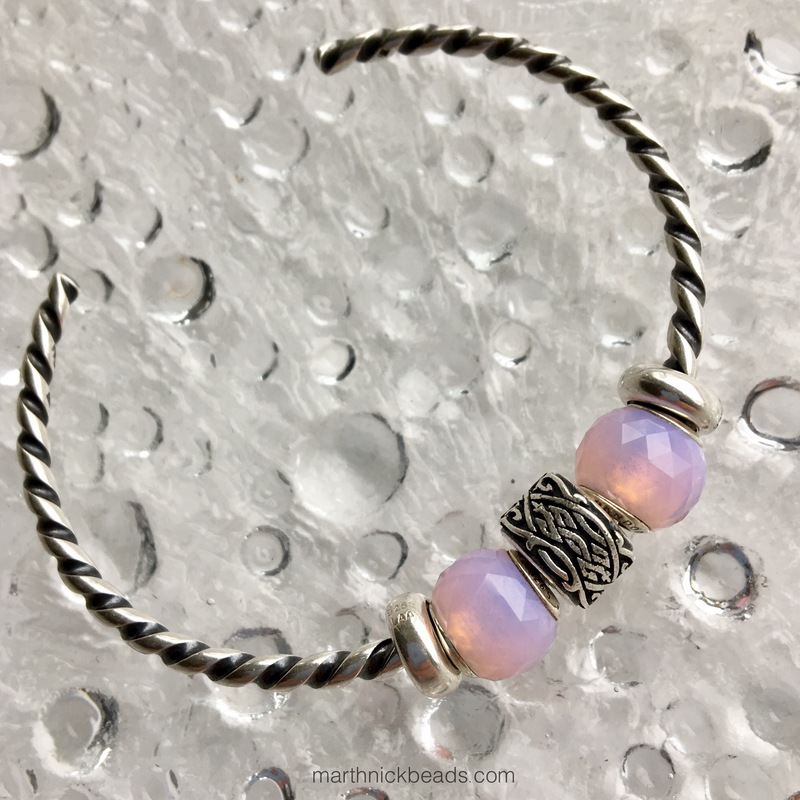 There aren’t many times a bead company comes out with a collection where I like every single piece and I think I’m not the only one who feels that way! Each of your bracelet combinations are really beautiful. I especially like the bangle with the facets and wheel of time and also, the purple glass with the firebird…the latter really has an Imperial and fairytale feel to it. Thanks Elise. You just can’t go wrong with these beads. I’m going to buy another Wheel of Time at some point as a pair would be super useful! Put one glass bead in between them and it would make a gorgeous bangle. But I’m sure everyone is thinking that way! I can’t get enough of these beautiful pictures. 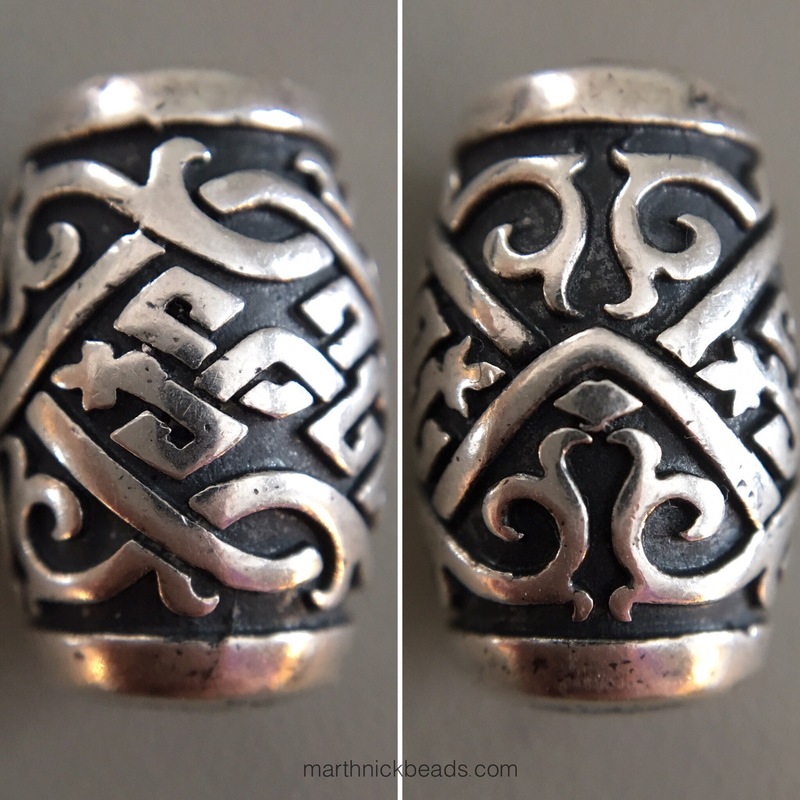 Everything works well about these unusual silvers – the design, the shape, the idea. OMG, the idea! I remember noticing the Once Upon a Time bead for the first time on Julia’s vacation bracelet, it at once caught my eye. I had never seen anything like this before, although the bead market today provides such a wide range of items that it seems really hard to come up with something actually new. Thank you Martha for this detailed review and thank you Julia nad Alexey for designing and creating this beauty. You are a true team indeed! I like that Svetlana, the True Beadz True Team! 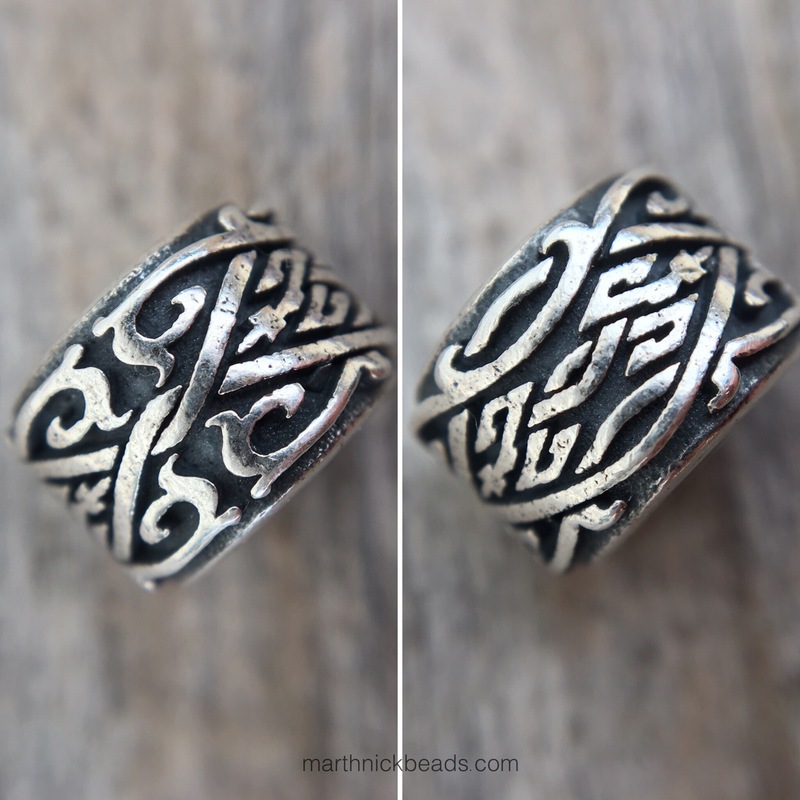 I really like them on the leather bracelet in the first photo. I’m just wondering if they slide around very much? Suzanne, they do slide around a bit but not much more than regular beads. 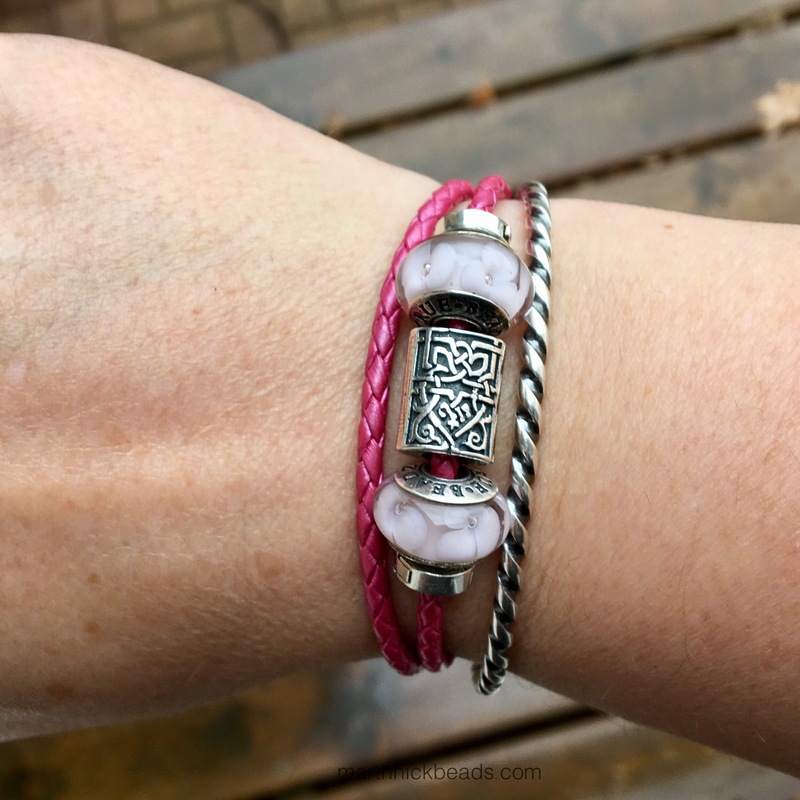 When I wear leather bracelets I usually do more criss crossing so that things stay in place, but for this photo I was trying to line things up in order to show the beads. They don’t fit on the Redbalifrog leather straps, I can tell you that for sure. Thanks for the info. I intend to get every one of the silvers. As you said, it’s not very often that you like every piece in a collection. As a matter of fact, it’s a first for me. I totally agree, Faye. Such lovely work! Faye, THANK YOU! It such a pleasure to see the collection is well received!